Enjoy jazz at your computer. Is there a better alternative to myTuner Jazz Pro? Is myTuner Jazz Pro really the best app in Entertainment category? Will myTuner Jazz Pro work good on macOS 10.13.4? myTuner Jazz Pro connects you to the music which defines the 20th century, and it's clearly one of the best listening choices while you work at your computer. 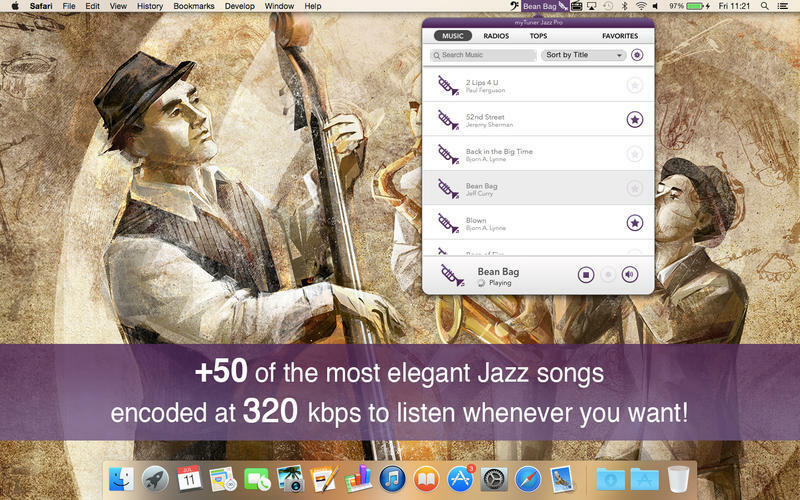 You will get 50 elegant jazz songs to play from your Mac. no Internet connection required. Have access to more than 50 elegant jazz songs, encoded at 320kbps, to listen to when you want. Select and listen to more than 250 different internet radio stations which broadcast jazz music, searchable by country. myTuner Jazz Pro needs a review. Be the first to review this app and get the discussion started! myTuner Jazz Pro needs a rating. Be the first to rate this app and get the discussion started! Check the top-selling jazz songs per country each day, so you can listen to a preview and check if you want to buy it. Add to favorite songs and radio stations you like for faster access. Record the music you like in real-time so you can listen again later. Listen to music in the background as you work. Minimal interface that is always available to change music. Use AirPlay for a better sound experience.